15 years cult-style season opening: Everything started with a crazy idea in the year 2004 when we started together into the season with you for the first time. After several editions and different locations we again want to welcome all automotive enthusiats from Germany, Poland and Czech Republic to celebrate season opening in a relaxed atmosphere. IMPORTANT: The spots for cars (indoor + outdoor) are limited and due to this a registration and selection of cars is necessary. 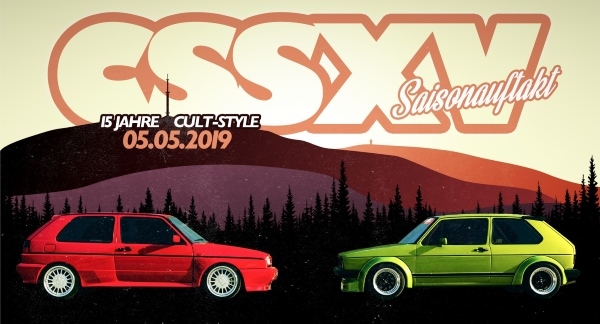 If you are interested to show your car at the event please register by sending us a short email (css@cult-style.de) including your name, full postal address (required for invitation), car brand/type and a picture of your car. Also feel free to invite your friends to the show. In case of a positive decision you will be informed via email first. Finally, you will receive a written invitation some weeks before the show. Therefore, it is import to submit your postal address.